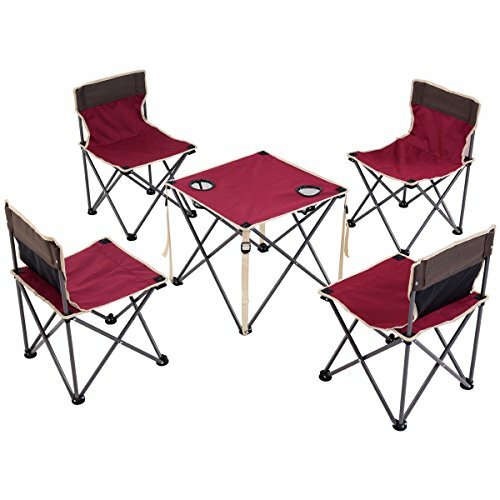 Costzon portable camping table and chair set. It can be easily installed, folded up and finally can be readily carry. It doesn't take up too much energy(only 12lbs) when you carry it by yourself. What's more, it's convenient to transport as well. Lightweight, portable and durable is perfect for indoor and outdoor activities, such as the beach, barbecue, backyard party, outdoor concert, camping, hiking and so on. Furthermore, even if there is a large number of people in your party, you still can have a wonderful time with your friends or family .Unfolding Dimensions doesn't take up too much space, and it even can be put into a bag which is more convenient for you. Portable & Foldable Design- This set can fold and unfold easily, all four chairs and the table can be put in to one bag which provided with the set. The chairs and the table are lightweight, which means an adult male can catch it easily. For Kids & Adults - This set can not only be used for your kids, but for adults with 245lbs chair capacity. Try to imagine: you and your friends have a family picnic, but your kids have no suitable chairs to sit and have no table to use, it's not a good scene. If you are a camping fancier and you always have some kids around you, then you need this set for your beloved kids. Sturdy and Comfortable Set- This set are made by Steel, ABS materials and 600D Oxford Cloth, which give firm frames to the chairs and the table. The Oxford Cloth can support your kids easily and offer a comfortable touching. Cup Holder Design- With 2 mesh pouches on the table surface to place your cups and net bag on the back for storage, ABS table base has anti-skid design. This adorable set is a PERFECT present to your kids. Outdoor and Indoor Use - This set can be used BOTH indoors and outdoors. It is compact while using at home. More people bought it for outdoor picnic for its portable and foldable as well. A beach, a pool, a grass land, you kids can use this set in all this places to enjoy their time.